My first visit to Capri was in September of 2000. We were staying in an apartment in Rome and had taken the train down to Naples for the day. Our goal wasn’t to spend much time in Naples, but rather to experience the island of Capri and all of its character and beauty. Capri sits off the coast of Italy in what is known as the Tyrrhenian Sea – part of the Mediterranean which is bordered by Sicily, Sardinia, Corsica and the mainland of Italy. We took a rocking-and-rolling ferry ride to the island and went about the business of exploring. 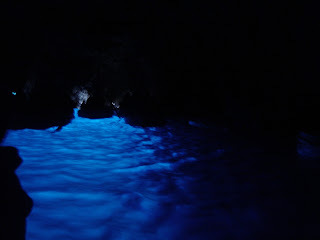 The biggest attraction on the island, and the primary thing I wanted to see was the Blue Grotto. Unfortunately the seas were too rough and the Blue Grotto was closed. 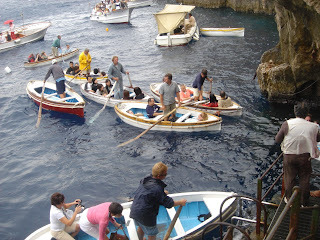 Returning again to Capri in 2006, we were happy to learn that the Grotto was open and we went straight there. We didn’t want to take the chance that conditions might change. The Blue Grotto is a unique cave-like impression in the side of a stone cliff, with a vertical opening to the sea. Only the very top of that opening is above the water, so the cave is dark except for this incredible blue light which gives the Blue Grotto it’s name. Once you pass through this tiny opening above the surface, you enter a large “room” with a high ceiling. The sun’s rays shine on the water outside, through underwater openings, and onto the white limestone floor of the grotto – this is where the Blue Grotto’s illumination comes from. We took a taxi to the location and descended a cliff-hugging staircase to sea level. Other folks were there from different parts of the world, and we waited in line for our turn – all the while watching the boats and the men who rowed them. The boatmen at the Blue Grotto have a unique style of rowing which involves standing, facing forward, and rowing with both oars. 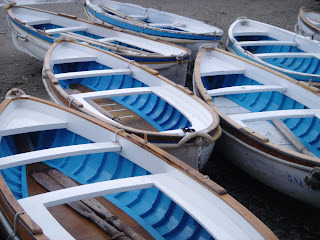 It’s a bit like the Venetian style known as “valesana” but in Capri they don’t cross their oars, and the oars are fastened to the rails so the boatmen can let go from time to time without losing them. I'm sure some of my readers know plenty about this style of rowing. Once in the grotto, some of them continue to row while seated on a thwart. The boats are little, maybe 10 or 12 feet long and many have the same color scheme. In truth they resemble old-fashioned lifeboats more than any other craft. These little rowboats are all over the place, there’s at least one large boat with a sunshade in this floating mess that seems to lack any order. Someone might show up in their own large vessel and rowboats will go over and take them to the grotto. Large tour boats also come by with plenty of passengers – hungry for the Blue Grotto experience. It seems pretty out of control at first but by the time you get to the bottom of the stairs, you’ve seen enough to recognize the order of things. Right then, some barefoot guy rows over with a big smile and an empty boat. He tells you to get in, how to get in, and what order to get in. 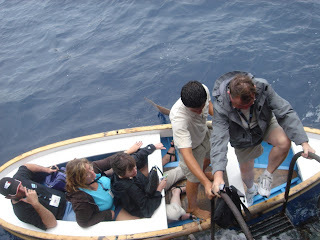 The surge of the Tyrrhenian Sea makes boarding the boat a challenging and sometimes wet affair. Your boatman rows around to the big boat with the sunshade, and everyone in your boat gets to buy a ticket. 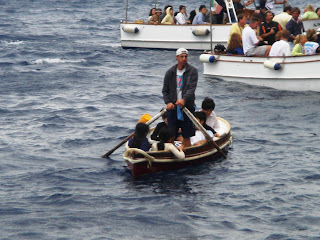 After buying the tickets, your boatman circles around, jokes loudly with some of the other boatmen, and seems to just be aimlessly rowing. 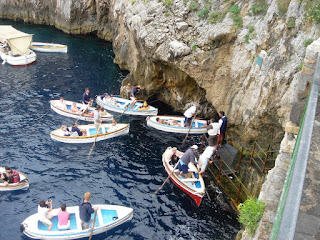 Then you see more little boats coming out of the grotto and you realize that he and all the other boatmen were waiting for the last group of boats to come out of the grotto. Now it’s time to enter the most famous cave on the island. As your boatman approaches the opening, he is telling you in a heavy Italian accent, to lie down, as flat as you can, “NO, FURTHER! STILL FURTHER DOWN!” You feel like a human pancake on the log ride at an amusement park. The opening is right in front of you and you understand now what all the fuss was about – it’s a tiny little crack! You think to yourself “no way, there’s no way we’re gonna fit through that”. Right about then your boatman grabs hold of a chain which feeds through that tiny crack, and with an Italian “heave-ho” between waves, you’re through. Now, all that craziness of prepping for and getting through the crack is replaced by a dark calm place which is illuminated by an indescribable blue light. I could spend a paragraph or two trying to describe the blue light that makes the Blue Grotto famous, but I could never do it justice. I’d have to have a much better camera to capture the true blue hue inside. Once in the grotto, your boatman rows you around in wide circles, tells you a little about it, and some of the boatmen sing Neapolitan songs like “O Sole Mio” and “Santa Lucia”. 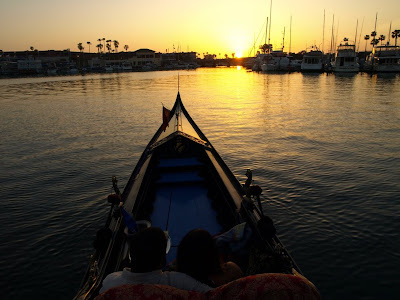 Being a gondolier, I couldn’t resist singing my own “Santa Lucia”, which surprised some boatmen, and probably irritated others. 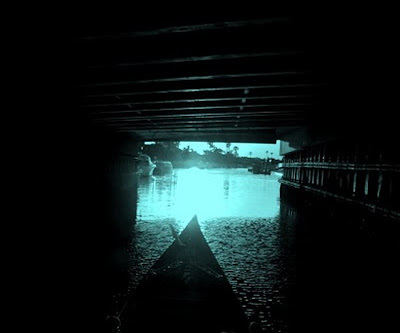 After your visit to the grotto, your boatman brings you back through the tiny opening and back into the world. 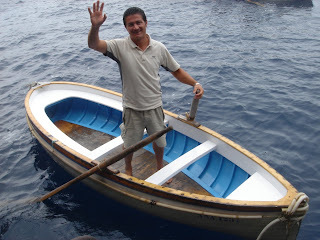 He pulls the boat next to the same platform you boarded from, you tip him, and you make your way up the hill again, probably to sample far too many different types of Limoncello before buying a few bottles and stumbling back onto the ferry that brought you to the island. 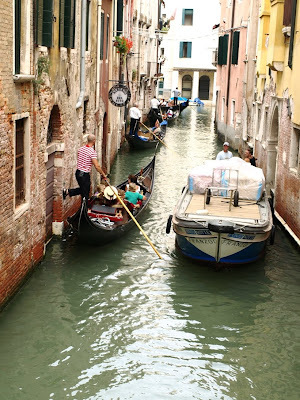 Labels: gondola tourism, non-Venetian boats, random fun stuff, underground boats, yeah - I'm a "travel junkie"
I have a friend named William Rich. He's an American who's been living in Europe for a while now. While living in Venice he became friends with remer Paolo Brandolisio - one of the few who still carry on the art of forcola and remo making. Paolo is a talented professional, in fact I row on one of his pieces nearly every day. 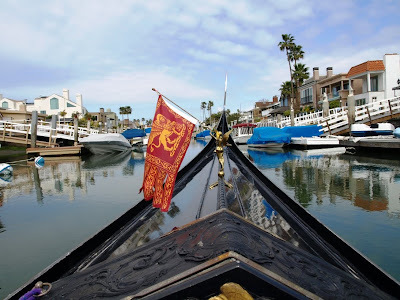 The forcola on my gondola "the Phoenix" in Newport is a Brandolisio creation. Recently William translated Paolo's website into english. I checked it out and as you might expect, managed to spend far too much time doing so. Great website, translated well, for a legendary remer. In case you thought the english speaking world was the only place pretty-boy heart throb bands came from. I'm here to tell you that they're more universal than you might think. Sonohra - a duo consisting of the Fainello brothers out of Verona has been turning out "popular music" for a few years now (and it looks as though one of them hasn't trimmed his bangs since then either). 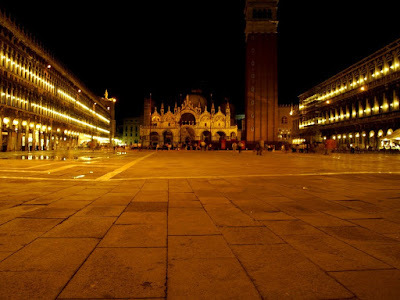 Check out the following video to catch some nice footage shot in Venezia. You'll notice that at 1:26 minutes into the video there's a short glimpse of a GSVVM caorlina. Nereo Zane recently alerted us to the final demise of the Johnson - a large derelict boat which sat on the ground near the GSVVM for many years. 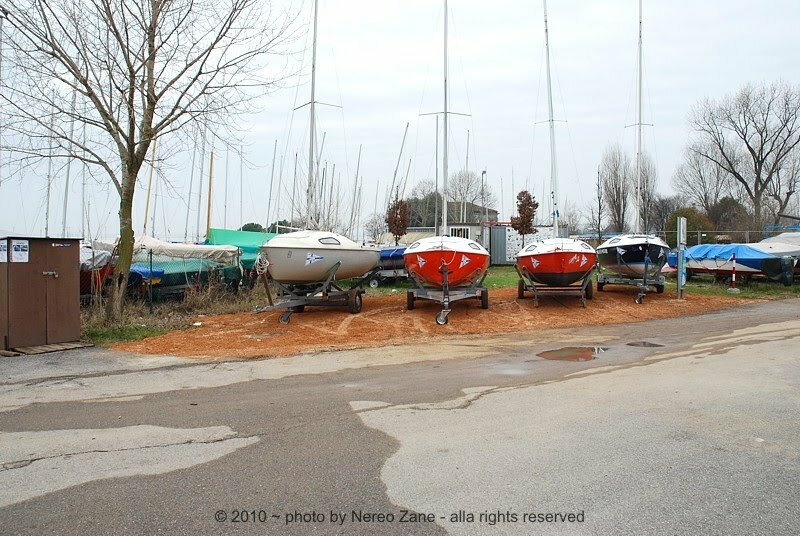 The spot where she sat for what seemed like forever, has been cleared and now is the storage space for some clean, new sailboats. Looking at the photo that Nereo has furnished us with, you can see that somebody has taken to posting announcements on a small shed-like building adjacent to the spot. But I can't help but wonder if at some point a club member might "enjoy a little more wine than usual" and stumble out there with a poster and a nail gun, only to mistakenly post their announcement on some poor guys new sailboat. To view photos of the Johnson, see my post from February 22nd, 2010. A few weeks ago I was contacted by a guy named Steve Roman in Minnesota who wanted to talk about cavalli. 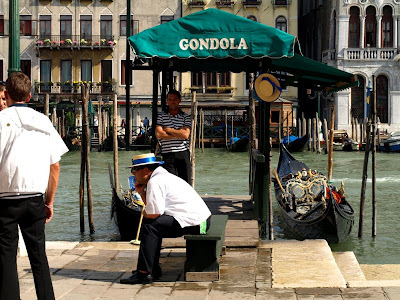 I've been obsessing over gondolas and the places they operate for 17 years now and have come to realize that there's always something new to learn. Just when you think you've seen it all, you're proven wrong by something new...or something you hadn't yet noticed. 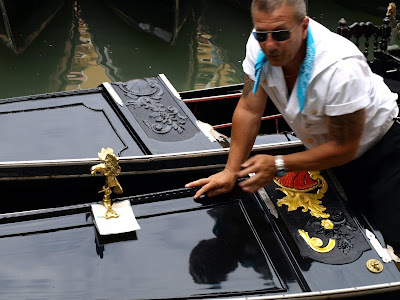 As Steve and I talked, it became obvious that he was a fan of gondolas, but more specifically, he'd become a true afficionado of the brass fixtures that mount midship on both sides of the boat. We call them "cavalli" (which translates to "horses") because the traditional manifestation comes in the shape of a horse with the rear-quarters of a fish or other sea creature. If you've been cruising the internet looking for interesting cavalli auctions, chances are good that you've found yourself bidding against Steve Roman. In his quest for more knowledge on cavalli, Steve came upon this video clip from the Fonderia Valese. In the spirit of full disclosure, I must admit that I never really gave much thought to the actual process that goes into creating these beautiful works of art - and that's really what they are, "works of art".Not all gondolas have cavalli, but almost all Venice-built ones do, and even some built elsewhere are adorned with these beautiful brass sculptures. 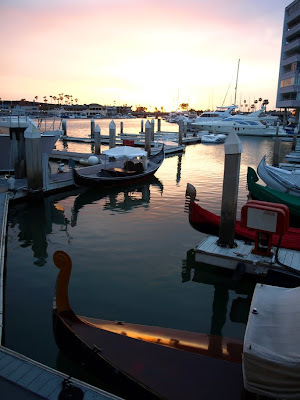 Many gondoliers feel that a gondola without cavalli is "naked".Cavalli often take the horse, or "hippocampus" form, but some are cast as angels, sirens, and sea-creatures. They also come in different sizes and levels of detail. Small ones can weigh less than a pound, while the more impressive and showy ones can tip the scale at more than 30 pounds. 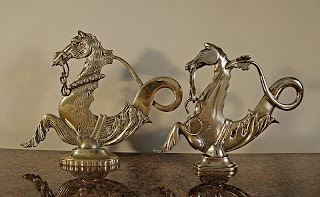 And while all cavalli are not created equal, they are also not all finished the same either - there are highly polished cavalli, nickel-plated ones, and of course the gold-plated ones. Many thanks go to Steve Roman for bringing this one under-appreciated detail of the gondola into clearer focus. To visit the website of Fonderia Valese, go to www.valese.it/index.htm. 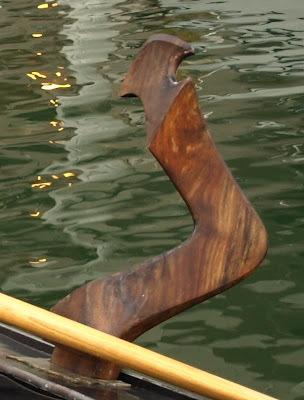 In the collection of strokes and techniques used on a day-to-day basis, some gondoliers incorporate their left foot, as seen in this photo: In Gilberto Penzo’s book “Forcole Remi e Voga alla Veneta” (available at http://www.veniceboats.com/), Gilberto identifies it as a "curious maneuver" and confirms what any experienced rower knows: that it's done in order to keep the tail of the gondola from bumping into things when the boat turns to starboard. Not all gondoliers do this. In fact I've spoken with some gondoliers who look down on the practice - saying that "a good gondolier shouldn't have to put their foot on a wall". I'm not really sure where I stand on this one yet. 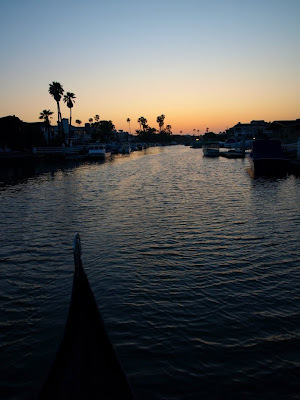 Where I row, as with many locations outside Venice, many of the waterways are lined with boats in slips, and most canals aren't as tight as the narrow passageways typically traversed by our Venetian counterparts. That said, I don't find a need to put out my foot very often. Certainly, I'd like to think that I'm good enough (or could become good enough) to not have to kick off, but until I experience things first hand, I don't feel qualified to pass judgement. "Before you criticize someone, walk a mile in their shoes". "Before you criticize someone, walk a mile in their shoes. That way, when you criticize them, you're a mile away...and you've got their shoes!" We all have our own ways of determining whether spring has arrived. For many people it has to do with ice on the water or flowers in the field. For Ingo Stahl in Bavaria, things are looking good; he just sent me word that:"Since five days spring has arrived - sunny and warm, 18 to 20 degrees celsius. Snow and ice have gone". During winter, the Bering Sea freezes with a sheet of ice two feet thick. Each spring, when the sea-ice cracked and floated away, we called it "breakup", and it was cause for celebration. I'm expecting to hear from a number of gondola operators in the Northern Hemisphere about spring launchings. If you're one of those folks who'll be "splashing" a boat soon - send me a photo or two and I'll post it here. They say that a fish market of one type or another has been found on this spot for over a thousand years. I don't know if that's an exaggeration, but it's been around long enough that someone decided to embellish the columns on a seafood theme. ...and of course here we have a "fish" theme. The fish market sets up in the wee hours of the morning, and by noon the place is either empty or on it's way there. It could be said that the columns are there to tell latecomers that they are in the right place, but missed the show. because nothing smells like a fish market. I posted a few great photos by Sean Antonioli in April of last year. To see them and read more about the Pescheria, go to my post from April 21st, 2009.
rowing into the sunset once again. 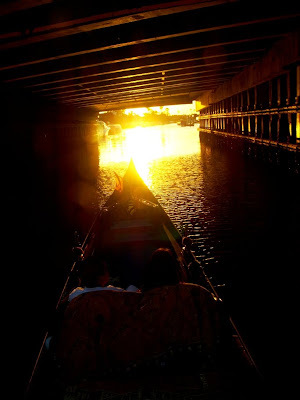 Talking with my passengers and singing under the bridge. It was like a thousand nights before. Yep, done it a milliion times...and loved it. Heading under the Newport Boulevard bridge. Gondolier Justin driving the Serena Lee. I shot this photo while walking through Campo San Toma. It's probably a safe bet that the gondoliers on the bench work at the Traghetto San Toma - one of Venice's best known traghetti today. The bench they are seated at is just steps away from "Calle del Traghetto". It's not an unusual name for a calle, in fact there are several of them in Venezia, and no doubt in centuries past there were many more, as in the 1820's the city had at least twenty of these canal-crossing ferry services along the Canalazzo, and many more servicing other areas. This area was at one time also home to the old Scuola dei Calegheri, where the art of making shoes was taught and perfected. When she was carved, I'm not sure if the impressive relief-work on the wall had anything to do with calegheri, or some other locally represented group. But today, whether they realize it or not, the gondoliers of San Toma are under her protective cloak. 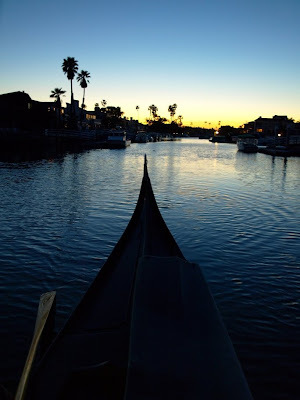 After a great cruise of my own, I wrapped my gondola and was walking up the dock when I saw a photo that I just had to take. Here's Joe Munday (aka "Giuseppe") talking with his passengers after taking them out for a relaxing cruise - he's standing in the front of the passenger area, while his guests are seated inside. Twenty minutes earlier, we were socked-in with overcast skies. 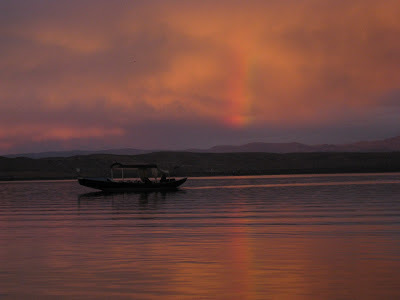 The whole scene was gray - devoid of color, then the sun dropped below the clouds and the bright spectrum of a rainbow shined through, painting the sky and reflecting off the water. In a spot along the fondamenta, south of the Rialto you can find Servizio Gondole Riva del Vin on the west side of the Venezia's Grand Canal - a traditional gondola service with some nice looking boats. The name "del Vin" is attributed to the fact that this was once a location known as a loading zone for wine. Walk by there and you'll probably see gondoliers and their boats. like most gondoliers they like to hang around, talk, and of course they love their cellphones, but there's a little more concern in the area of presentability. Gondolas and gondoliers tend to be better dressed than in some other places. Custom upholstery and boat details are visible. and belive it or not...hats! Maybe I just caught them on a "good day", but when I come upon guys who are lucky enough to have the best job in Venice, I like seeing more than just a striped shirt and a smirk. I posted another photo from Riva del Vin on July 5th, 2009. Even the boat covers look crisp in that photo. Just the Photo - "Piazza After Hours"
I dropped down with my tripod and shot this lockdown photo with a long exposure. Most days I spend the first half of the day watching the weather, to determine what conditions I'll find myself rowing in during the second half of the day. Today the winds were up, leading me to believe that I'd be fighting a decent gale from the west, but by the time I got to the docks, a calm had settled in and my evening on the gondola was as perfect as a dream sequence. 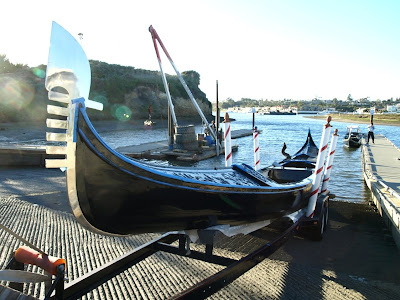 As spring arrives and the weather improves all around the Northern Hemisphere, I'm reminded of all my friends in the gondola business who are preparing for the annual launch. In places like Minnesota, New England, Nebraska, Northern Europe and the UK, just to name a few. Somewhere, right now perhaps, someone is brushing on another coat of beautiful black paint. Someone is prepping to apply bottom-paint. Another gondolier is likely pulling out floorboards and other parecio pieces from storage to prepare for the big day. They glow with anticipation for the moment when the hull of a beautiful gondola will once again float - on waters that were blocked-in with ice not long ago. They look forward to the golden moment when they can once again stand on the back and row - like they've wanted to do all winter long. Launch day is coming, my friends. I wish you a great launch, followed by an even greater season - full of cruises that feel like a dream sequence. 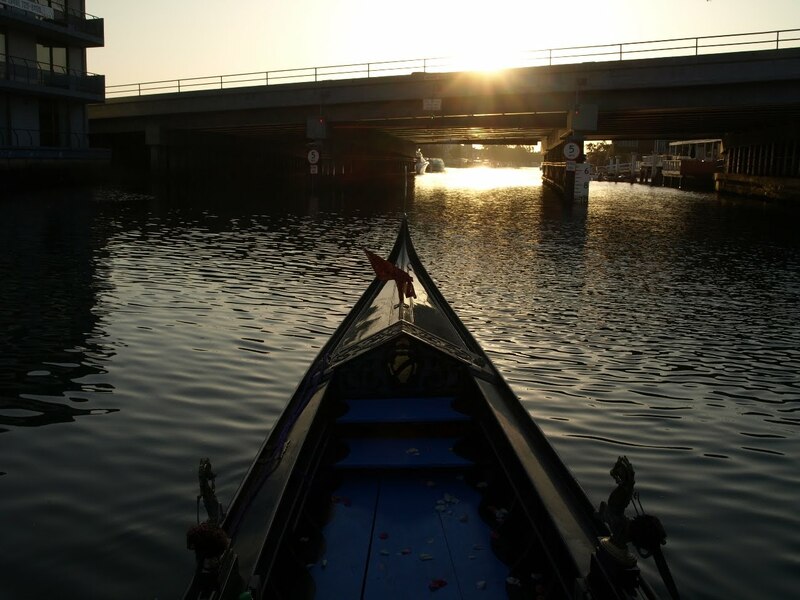 For a "gondola fanatic", there's no shortage of gondolas to look at and details to discover in Venice's Bacino Orseolo. Today's photo is filled with cool details. For most of you though, the red seats were probably the first thing that caught your eye. Followed perhaps by the question "why is the seat flipped up?" 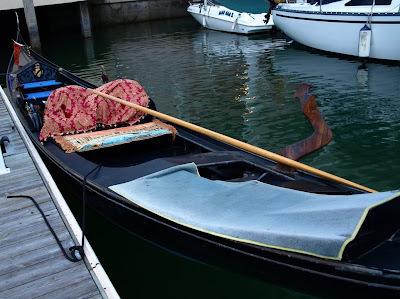 Gondoliers in Venice often flip up the bench-seat. 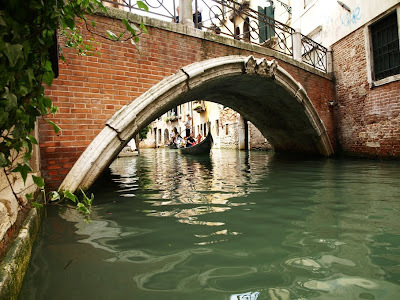 It minimizes the sun's damage, and in a place like Orseolo where gondolas are rafted up by the dozen - I'd imagine that it keeps other gondoliers from stepping on your seat while they make their way across. Now let's take a look at the rest of the shot. Starting with the gondola closest to the camera; based on the carved deck and quality of the parecio in view, we can tell that she's a wedding gondola. 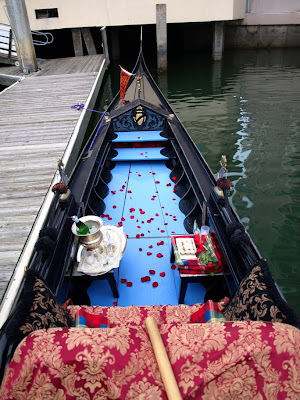 Carved decks are a hallmark feature of a wedding gondola, and many only have carvings on the bow and stern decks. More extreme ones have carvings along this rail area - a part of the boat known as the "nerva". The forward buso (hole for a forcola) has an impressive buso-plate. Gold paint (or possible gold-leaf) adorns both the fodra and pusiol. The cavallo mounted on that pusiol is a "trumpeting angel" design in standard brass finish. The trim throughout the boat looks to be stainless steel rather than brass. While we can only see a tiny fraction of the floor, it appears to be a black-on-black design with gloss and flat contrasting (the flat could be a non-skid surface). If you haven't already figured it out, the gondola closest to the camera is the same one we looked at in my "Scimier of Justice" post not too long ago. Based on another photo I took during this session, I can tell you that the red-seat gondola is not a wedding gondola, but her owner makes up for it with several nice additions. The most eye-catching feature on this boat might be her cavalli - these are a somewhat unique variation of the "hippocampus" design. It's not the variation on the horse configuration though that grabs the attention - it's the gold plating. Getting these babies plated isn't cheap, but you get a lot of "bang for your buck" with gold. The cavalli sit on some nice, solid pusioli which have no intricate detail - they seem to draw ones attention toward other details on the boat. The fodre (boards mounted to the inside of the salon area) are not as subtle; dramatic black dragon-like creatures embellish a field of gold-leaf, with a circular coin design. That coin design can also be seen above the seat in the center of the scimier. It's an artist's interpretation of the 5 Lire coin which was in use before Italy went to the Euro. Actual 5 Lire coins weren't gold, they were an alloy with a silver finish. The date on the coin is 1962 - I'd be willing to bet 5 Lire that the owner of this gondola was born in 1962. I did a little research, and it looks like this coin, known by some as a "delfino" wasn't actually pressed during 1962. They were minted from 1951 to 1998, but certain years saw no production of this coin. If that's true, I wonder if that gondolier knows it. Solidly built banchete (little benches) and one of the one-armed chairs are visible. This boat also appears to have stainless steel trim. Red is a theme color on this gondola. There are the obvious red seats, traditional red floorboards, the gondolier's hat sticking up has red ribbon, we can see the corner of a red tapeto (carpet for the gondolier), and the whole thing ties together with a red and black rope and pom-pom setup which are curiously tied to those cavalli - perhaps for safe keeping. 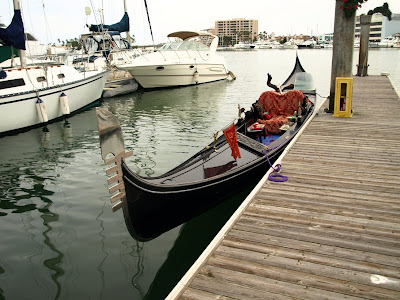 The gondola behind the red-seat boat looks more like the standard vessels we see in Venetian traghetti. Seats are black, and there is no tapeto. 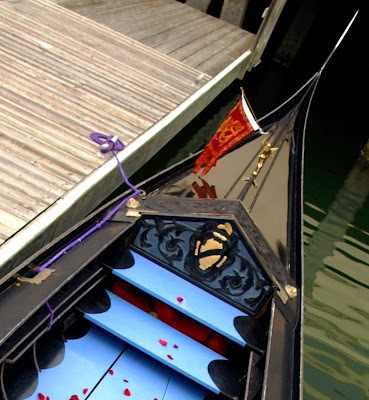 Many of the gondolas in Bacino Orseolo are rafted with their forcolas out; often on the deck. As boats come and go, I imagine forcole can get hung up on the ferro or tail of another gondola. The forcola on this boat has a shim-piece mounted to the inside of the gamba (the part that goes into the boat), this helps ensure a good fit without tapping in wedges each time the forcola is put in place. The last boat in the frame still has her forcola in place. Perhaps she's just come in or is about to depart. Like the boat she's next to, this gondola has brass trim and no tapeto. The gondolier has two remi stowed at the back of the boat. Both oars have been repaired, with a darker wood having been scarfed into the area that gets worn over time. At first glance, this looks like a jumble of gondolas - one with red seats. But as we look deeper, and examine the details, we see so much more. 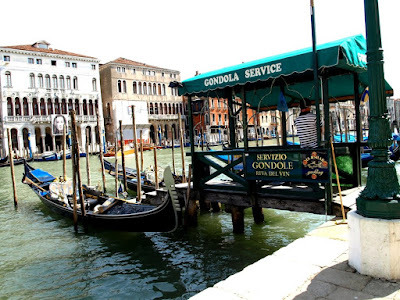 And if you've read through it all with me, then you too are probably a "gondola fanatic". 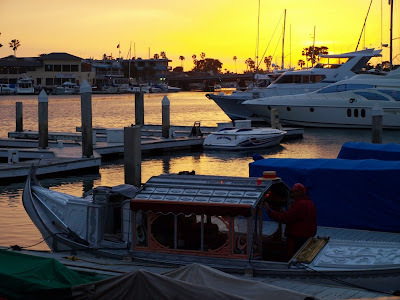 Once again I found myself out on the waters of Newport Harbor. Today the winds were up a bit, reminding me of challenges I'd faced before when I was much newer to Venetian rowing. 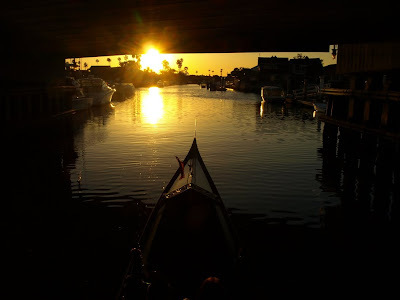 As I approached the Newport Boulevard bridge, it occurred to me that these were almost the same exact conditions I'd encountered one day while rowing with Angelino Sandri of Gondola Servizio in Oakland, California. Shortly after Valentines Day of 2000 I flew up to Oakland to receive some instruction from Angelino at his operation there on Lake Merritt. It was immensely helpful as prior to that I'd learned the basics from an American who's training had been passed down from a long series of other Americans. He was a good friend of mine, and a great gondolier, but I began to realize that in the "passing down" process, some things had been lost in translation. Angelino had learned to row from Venetians, in Venice, and because he went right to the source, he had a more educated style and understanding of the artform. Among other things, he taught me how to row sotomorso - a technique I hated, until I got it. After that I couldn't stop thanking him for it. 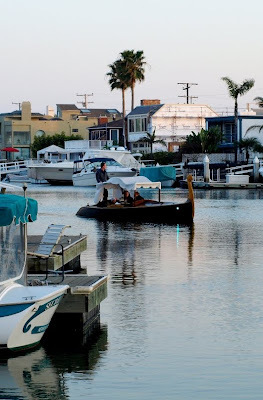 A few weeks later Angelino was in my neighborhood visiting family and we took my wedding gondola out for a sort of follow-up session. It was there that I faced the wind, the same wind I rowed in today. I rowed against the wind as it blew from the same direction it had ten years earlier, and I had that sort of deja-vu type of experience we usually only see in movies. The wind this time of year tends to bottleneck at the bridge, shooting through with extra pressure in that tunnel-like passageway. If you keep your ferro into it, at a slight right angle (which is a tiny bit to starboard) you can continue to push forward through the tunnel. Push too much and you'll need to quickly correct with a stalia stroke or two, don't push hard enough with your premer stroke and the wind will toss your bow in the other direction. Sure, you can point your bow straight into the wind, but keeping it "just right" requires a more timid approach, which doesn't allow you to make much headway. Keeping it to the right, you can use more power. It's a good example of finding the right balance, and if you do it several times a day, it becomes second-nature. But ten years ago I was still getting to know that scenario, and the whole experience was much more, shall we say "exciting" back then. Today, as I was heading into the wind, I don't remember exactly what it was that triggered my memory, but it brought a smile to my face as I rowed - doing pretty much my favorite thing in the whole world, once more. A wind that used to be harrowing, is now a welcome challenge, and something I look forward to. nowadays I press through it with a smile...and a song. Thanks are due to Angelino for his patient instruction so long ago. Happy St. Paddy's to all my friends who are either Irish, or who pretend to be for one day. Spring may still be a few days away, but you could have fooled me. The weather was amazingly reminiscent of May. 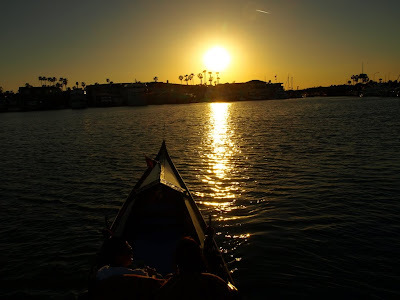 I rowed my cruises tonight into the late evening, and as I drove home at around 11pm it was 72 degrees out - I rolled down the windows and enjoyed the change. Here are a few shots I snapped before it got too dark to shoot from a moving boat. My reservation staff says that the phones are ringing off the hook. Follow-Up to "What the HECK Happened Here?!" For those of you who've just joined us here on the Gondola Blog, on March 7th I posted this photo, inviting readers to present ideas as to "What the HECK Happened Here?" I got some great ones too. You're setting up for "my kids are lost in our balloon gondola" publicity stunt. Balloon was slowly inflated and used to roll gondola on its side. 24 jet propulsons are colored yellow and red for camoulflage. I think its a modular housing unit, built especially for gondoliers while doing that never ending maintainance. It even has plumbing and wiring, check out the pipes and wires on the ground. Solar Heated!!! Something he would know a lot about. I'm happy to inform you all that somebody got it right. Congratualtions are due to Bepi Venexiano - you were right on the money. Tamas in Hungary figured it out too, comparing it to a truck rolling procedure he once saw undertaken by firemen. I would guess that several more of you did figure it out, but opted to go with something funny instead, and for that I thank you. Joe Gibbons originally sent me the photo, but it was Robert Dula who took it and was responsible for the operation. First position boards as you normaly would. 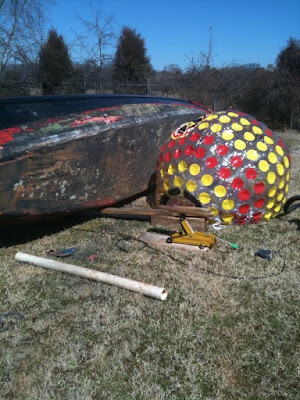 Next, jack up gondola, to give enough clearance for sliding deflated ball under the mid point. To reverse... fill ball partially, to cushion, and push gondola onto ball. Leave the valve open and the gondola will slowly lower, and rest on boards. It helps to have an assistant ready with boards, in case the gondola tips too far. I discovered this too late. Fortunately, I was on dirt and the ferro and lama di poppa stopped the fall. I wish I had a video of the process. It would have been entertaining. Great piece Robert. Thanks for getting it to me. Two gondolas were playing dodgeball and the one in the picture was the loser. Thieves were in the process of a "gondola-jacking" when the gondolier discovered their dastardly act. He reacted by throwing a giant beachball at them and they fled into the night. This is a crime-scene photo from a vicious "clown bashing" incident. The weapon was a section of white plastic pipe, and the victim was wearing his most colorful plastic polka-dotted raincoat at the time. Some college physics students conducted an experiment to determine "if you drop a gondola and a beachball at the same time, which falls faster?" They used modified floor-jacks to launch each item into the air - one can be seen in the photo. Anybody else got an original explanation for what happened here? 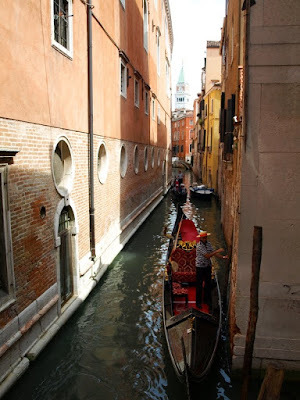 Walking through Venice, you cross dozens of canals; most are a bit wider than this one. But tight quarters are the norm in Venezia. This guy decided to tie up right there in a narrow canal with a steady flow of gondolas coming through (one at a time, of course). Notice the top of the Campanile in the distance. 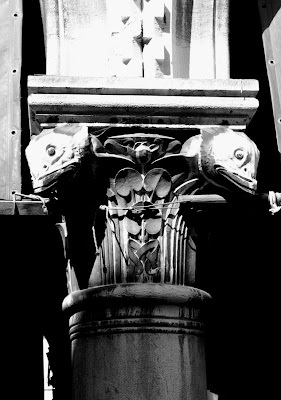 Just the Photo - "Framed by an Arch"
Bacino Orseolo - the "Scimier of Justice"
On privately owned gondolas, certain areas tend to carry signature information which can often tell us about the owner of a gondola. One such area is called a "scimier". This decorative piece mounts above the seat-back. It's not a necessary piece of equipment, but many gondolas have one. This scimier appears to have a gold-painted, carved representation of "Justice", holding scales while a lion looks on. 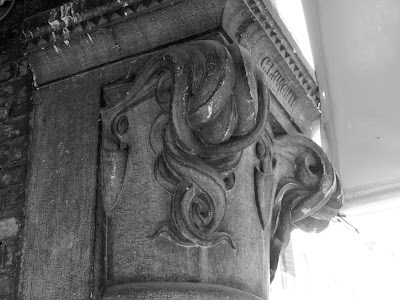 The lion most likely represents Venice, while the "Justice" character is probably the justice of the Republic. Looking at the aft deck, we see carvings, indicating that she's a wedding gondola. This is a nice side-by-side photo with the tails of a standard gondola and a wedding gondola. The owner has added custom cushions and a matching cloth that hangs from the back of the seat. I've often called it a "cape", but drawings I've seen by Gilberto Penzo identify it as a "strasino". Whatever you call that piece, it looks great on the boat and creates the perfect place to stow things you need to get to during the cruise. As I mentioned earlier, the scimier can sometimes tell us about the gondolier. Maybe the guy who rows this boat is also a lawyer. In a series of posts from early January, we saw photos and video of the gondolas operating in a famous casino in Las Vegas. The boats there, and in her counterpart in Macao, are unique in many ways - many of which can be seen by looking closely at the stern of the vessel. 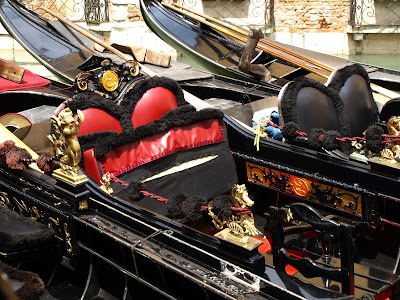 One cannot help but admire the detail put into the upholstery of these gondolas. It's not really reminiscent of a Venice-built gondola - more like a horse-drawn carriage, but the quality and comfort are impressive. The wood used as trim and seat framing was cut using standard patterns, but then each piece had to be handcrafted - some were placed in a very large steam-box to add the necessary curve. All screw fastenings were countersunk and plugged with matching wood before the whole thing was stained and varnished. You think you see seat belts in the salon? Indeed there are seat belts, but not because these boats move at unsafe speeds. The seat belt story goes back to a decision made by someone who was obviously worried about liability and lawsuits. The main idea being that if a stupid drunk guy tries to stand up in the middle of the ride, and the boat is heading under a low bridge, he's less likely to hit his head on the bridge if he's buckled in. And, more importantly, he's less likely to sue the casino. As the boats are routinely boarded from the port side, a small step is located on that side. The top has a nonskid surface, and the step does a great job of keeping people from stepping on the upholstery. Looking at the photo below, you can see the metal cap of the charging port, which is located on the inboard side of the step. During down time, this is where the charge cord is plugged in. These boats do have forcole, but the design has a serious difference: the morso is turned 90 degrees and serves as a holder for the remo, which is used more as a rudder than a propulsion oar. Over the years, the gondoliers who operate these boats have learned how to use the remo as an oar. The style of rowing could best be compared to the sotomorso style used when a Venetian gondolier has stepped forward onto the trastolini - trailing his remo behind him and making fishtail movements with the blade. 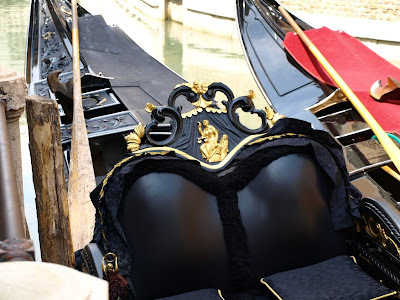 At one time, I heard rumors about how some gondoliers there were refusing to use the motors and had to be chastized by management to insure that the motors were being used. the flow of traffic is more manageable. Each boat's throttle can be adjusted, but the controls for that are under-deck. Once again, liability has reared its head in another form: tendonitis of the wrist. 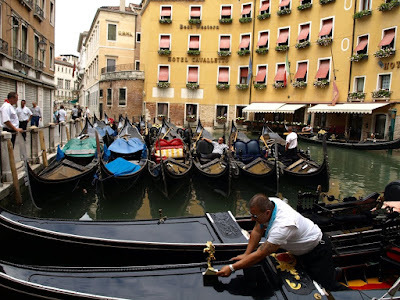 There are, from time to time, gondoliers who develop a painful movement-related condition of the right wrist. This is why you may see some gondoliers there wearing gloves or wrist braces. I would imagine that blisters have also prompted some to wear gloves. The threat of tendonitis has also supported the argument from management that using the motors was necessary. So how do the gondoliers operate the motors? They step gently on the buttons on the deck (you can see them more clearly in the top photo). When I last checked, one was the on/off button for the carefully adjusted forward propulsion. Step on it once and the boat goes forward. Step again and it cuts power to the motors. The switch toggles on and off. The other button was what could best be described as "the closest thing to a brake pedal on a boat". Step on that other button and the motors go into full-throttle reverse. 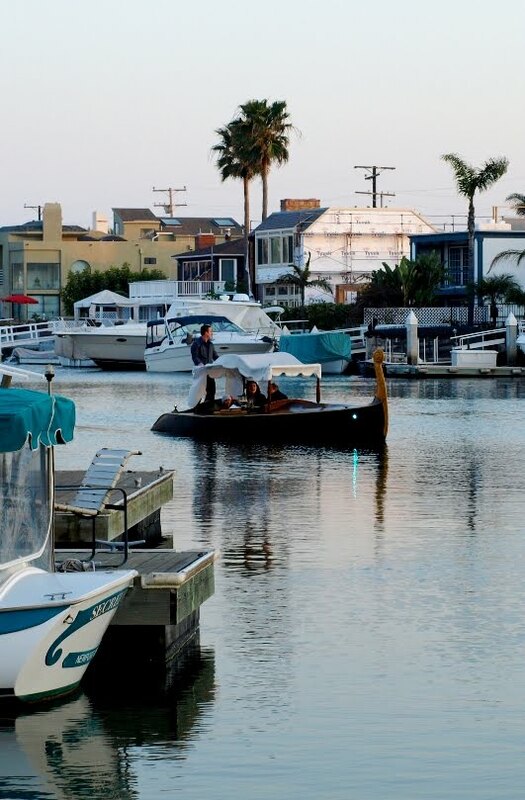 Some have described it as the the "OH $#i@ button"
Operating these boats requires a combination of skills, and most of the gondoliers who pilot them do an exceptional job – spectators along the canal, typically have no clue as to whether motors are involved. 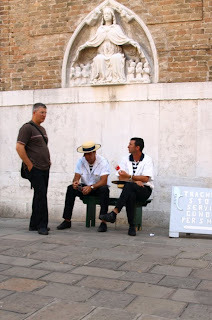 The gondoliers’ job description also involves a lot of interaction with the passengers aboard, and then there’s the singing – but that’s a subject for another post. I love duct tape. It's an amazing thing. Originally designed by the US military to keep ammunition dry this wonder of the 20th Century has more uses than a whole box of hand tools. I've often said that "if it can be solved with duct tape, zip-ties, bungee cords or a little bit of cash - then it's not a real problem". I almost always have a small roll in my gondola bag, preferrably black. Duct tape was first developed during the Second World War, and while it's known by many names throughout the world, it's universally recognized as a handy and effective way to solve almost any problem to one degree or another. Duct tape's a standard fixture in the NASA toolchest - in fact it is said to have "saved lives" on Apollo 13. Long distance snowmobile racers tape their faces with it! There are many automotive applications ranging from bodywork to mechanical. Duct tape makes a great temporary bandage. A buddy of mine has a duct tape wallet. I've seen duct tape belts. Heck, I recently read about some girl who made an entire prom dress out of the stuff! Must have been heavy. And just when you think you've seen it all, you discover a new use for duct tape. 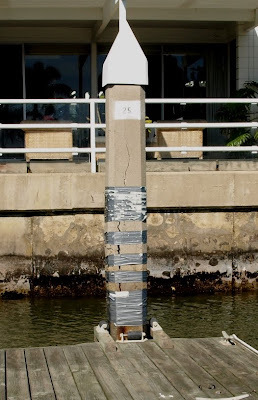 Last week I was rowing my gondola through Newport and I spotted this duct tape masterpiece. Got a VW bug with a fender coming off? Duct tape it! Got a life-or-death problem with your spacecraft? Duct tape it! Wanna design your own prom dress? Duct tape it! 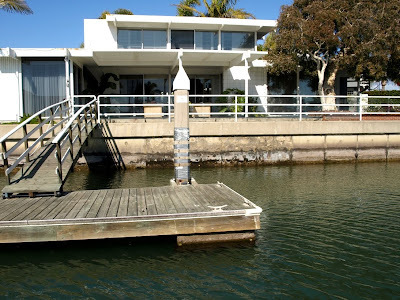 And...got a concrete float-dock piling that's coming apart? DUCT TAPE IT! “Magnetism is one of the Six Fundamental Forces of the Universe, with the other five being Gravity, Duct Tape, Whining, Remote Control, and The Force That Pulls Dogs Toward The Groins Of Strangers." A while back I posted a photo of a red rainbow shot in Newport, with a little background on the unique phenomenon. she now manages the place, and quite well I might add. Thanks for letting me post the photo Sarah - It's one of my favorites. Squero San Trovaso - "There's a Hole in the Floor!" 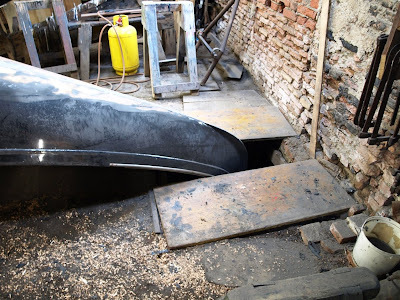 Part of the gondola building and maintenance process requires squerarioli to flip the boat over so they can get to the underside. You'd think they would do this all above ground, but no, not the Venetians. They dig a hole in the floor so the whole operation is lower to the ground. Sure, you could set up planks, and do all your work from higher up, but for various reasons they prefer this method. I'm just spitballing here, but do you think some old grouchy gondola builder fell off a plank centuries ago and made a new rule from that day forward? It could happen. With a sprained ankle and a bruised ego, an angry guy with a shovel could dig a hole pretty quickly. Photo taken this afternoon in the canals of Newport. We had horrible weather today. I don't know why anybody lives in California. OK folks, we're gonna have some fun with this one. And post it in the comments. In the coming week, after I've received some good comments, I'll post the answer. 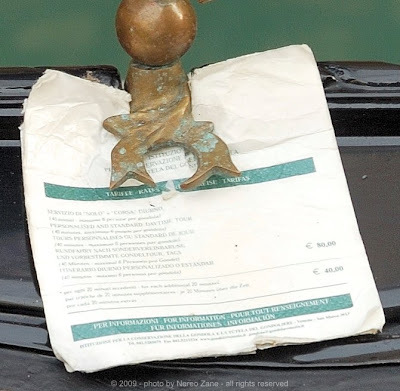 I've seen these all over Venice - small pieces of paper tucked under the edge of the canon or other bow fixture. 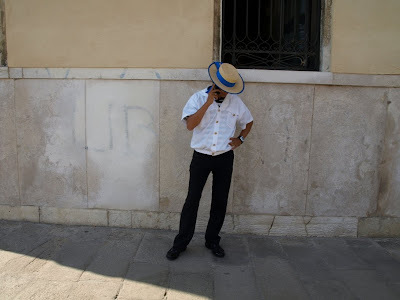 The first time I saw one, there was no gondolier around, so I thought maybe he'd left a note for someone in case they showed up before he returned. Then I saw more of them. I thought "wow, there sure are a lot of gondoliers leaving notes for people". After a while I started to see some uniformity and began to consider other possibilities. Release of liability if a guy proposes on board and his lady rejects him? Nereo Zane sent me this photo, and after some inspection, it appears to be a price list. The way these are posted faithfully, I'd guess that they are required, or at least strongly encouraged. Have any of my readers read one? Thus far I haven't plucked one off a guy's bow to get a closer look. "What are you lookin' at!" I must begin by saying that usually my gondola doesn't look like this. There's often a healthy amount of dust and salt everywhere. Only after a fair dosage of preparation and primping does she reach the "all dressed up" point, and this evening, while the light was still good and just before my passengers arrived, I snapped a few photos of her. I think if my gondola could talk she'd say something like "remember me this way".